Cutler Marsh is an impoundment in Northern Utah's Cache Valley on the Bear River just outside of Logan. It is popular with locals, but not often fished by anyone else. 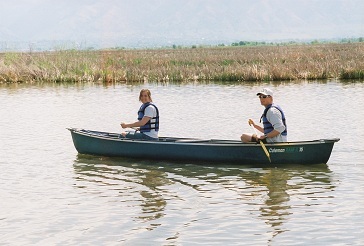 Its often shallow waters means that to access much of it you'll need a small canoe or other boat. Get away from the access points and crowds. Take a canoe or shallow bottom boat and find a deeper hole where you can baitfish using worms or cutbait.